One hundred and fifty years ago, nineteen feudal retainers of Satsuma covertly set out for Great Britain. The Satsuma students, who had embarked from Japan at the risk of their own lives, expanded their horizons through their travel and greatly contributed to Japan’s modernization in various fields. Hashima from which they set out is called “the dawn of Japan’s modernization.” A ceremony called “Reimeisai” is held in April every year mainly by the local people in Hashima and they have been honoring the achievements of the Satsuma students in public since 1989. Recently, historical sites regarding Japan’s modernization have drawn much attention and the public has become more interested in the modern history of Japan after the end of the Edo Period. Some thoughtful people have been proposing that a facility, which exhibits materials regarding the Satsuma students and introduces their achievements to many people, should be constructed. In addition, a movement for the establishment of such a facility rapidly grew with the 150th anniversary of the Satsuma students’ embarking for Great Britain, approaching in 2015. In this way SATSUMA STUDENTS MUSEUM was finally established. ”Hashima Nights” meetings were held at regular intervals in which local volunteers discussed how they could make use of Hashima, (people, cuisine, natural environment, culture) in relation to the museum and its design. This library is designed to commemorate the exchanges between the United Kingdom, the United States and Ichikikushikino city. It is used for orientations for visiting groups. It can be used not only as a library but also as a waiting room, a lecture room, lunch space and so on. People can enjoy the relaxing atmosphere in the study-style space. This museum shop puts many articles for sale: original goods, goods regarding Hashima or Ichikikushikino city, and traditional handicrafts of Satsuma. This is a space for rest and conversation. You can enjoy English style teatime in a comfortable atmosphere. The deck space outside is appealing. The counter is made of Hashima stone and the wall in red colcothar reflects the image of samurai residences of Satsuma. The exhibits, starting with a picture scroll of the Anglo Satsuma War, introduce the reason why the Satsuma students were sent to Great Britain even though the dispatch violated a national seclusion policy. Some articles which the students left in Hashima are also displayed as symbolic exhibits. Two films introduce the reason for dispatching the Satsuma students to Great Britain. The historical significance and their stories are alternately screened. The narrator is Miki Sumiyoshi and the magnificent original sound track was composed by Michiru Oshima. We do hope you will watch these films with English subtitles, which outline the history of the Satsuma students. This is the space for introducing the voyage of the Satsuma students. A globe with their route from Hashima to London was produced with a motif which belonged to Nariakira Shimadzu. There are some photos and materials displayed on the wall so that visitors can see the ports of call where the Satsuma students stopped. Their journey to London with surprises and confusions is reproduced with anecdotes from their diaries and some articles. There are materials introducing what they saw and heard firsthand after reaching London. There is a long-table in the center of the 2nd floor with models of a dock which the Satsuma students helped construct and relief maps in chronological order. The wall is flanked with films, which show what the students saw and experienced during their travel. The accomplishments of the Satsuma students are introduced by means of various materials, models, and films. The models of a spinning factory in Kagoshima and a brewery started by the Hokkaido Development Commission are included. We hope you will appreciate the depth of the industry and culture which the students brought into Japan as well as their ways of living with ups and downs. Special exhibitions regarding the Satsuma students will be held in this space with various themes. There are large-sized display cases made of glass for exhibiting three-dimensional showpieces. In addition, there is a mini theater. Currently a special exhibition in commemoration of opening the museum, “A Life of the Youngest Student Kanaye Nagasawa, Who Became the Grape King” is being held. In the mini theater, two films, an original film, “The Last Samurai Who Became the Grape King” and another film, “Kanaye Nagasawa’s Life” which was provided by MBC broadcasting station are now showing. The shallows from which the Satsuma students set out can be seen from the deck on the second floor. The deck, with a wooden mast, looks exactly like the real deck of a ship with the sea spreading below. 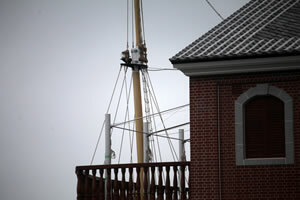 In addition, the specifications of the mast are the same as those of a mast on a steam sailing vessel. These elements can help create an atmosphere as if people were standing on the deck of the “Australian”. Visitors can also enjoy drinking at an evening bar while they are admiring the sunset. Parties can be held here.